This production opened on October 11, 2013 and closed on October 20, 2013. Swamp Meadow’s production for the fall of 2013 was The Crucible. 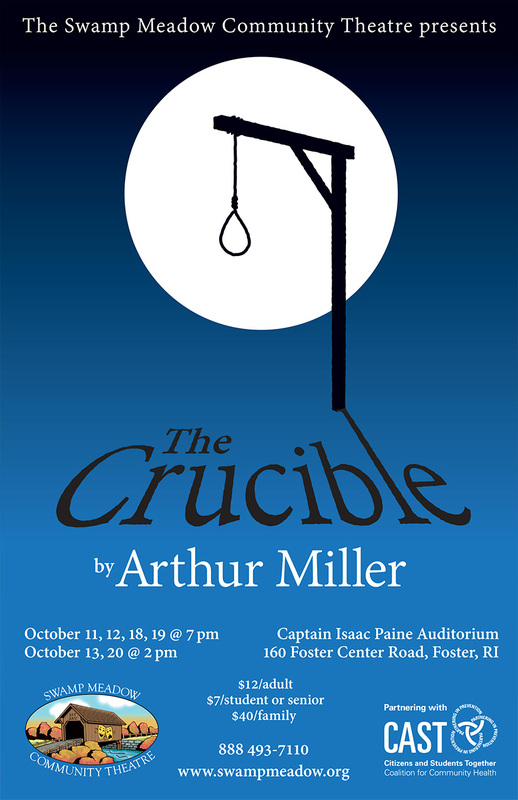 Written in the early 1950’s, Arthur Miller’s classic work takes place in Salem, Massachusetts in 1692. It recounts the events surrounding the Salem Witch Trials. This was a time when paranoia, hysteria, and deceit gripped the Puritan towns of New England. From those events, Miller crafted a brilliant and timeless tragedy. Far more than a period piece or political allegory, The Crucible, with its cast of unforgettable characters trapped by their own choices and swept along by events, has continued to speak urgently to theatrical companies and audiences for the past sixty years. It remains one of the most popular productions in the country, for both the professional and amateur stages.